1. Compatibility with Apple devices: iPhone/iPad/iPod, audio/Video transfer to display/projector/TV with HDMI port. 2. Most Apps Support: YouTube, Hulu Plus, IDMB, Quickflix, Family On TV, ABC, NBC, FOX and local videos and more on your Apple Devices. 4. Support all formats of audio and video. 5. Plug and Play: No need Personal Hotspot/Airplay, no need any setting/App on your Apple devices (iPhone/iPad/iPod) side only click the "Trust" button while connect it. 6. Safe: Be assured that it's reliable and has no problem to connect with your Apple devices. 7. More stronger durability than you would normally find with an Apple one, the lightning to HDMI adapter has an additional layer of protection to improve durability and reduce fraying. 8. Affordable price on the adapter market. 1.Please make sure the lightning female port is connected to the charging power supply, if not, the item will not work. (Strongly recommended apple USB cable and adapter 5V/2A). 2.The adapter will get a little hot whilst using but it's NORMAL and SAFE. 3.Due to HDCP copyright protection measures, the lightning to HDMI adapter doesn't work with some paid contents including Netflix, Amazon video, HBO go, HULU and Honda motor, please refer to the terms and conditions of those apps. 1.Connect an HDMI cable to your adapter, then connect the other end of your HDMI cable to your secondary display(TV, monitor, or projector). 2.Connect a 5V/2A Lightning Charger to supply power to your adapter. 3.Plug your digital AV adapter into the charging port on the bottom of your iOS device. 3.Switch the TV/projector's output to corresponding HDMI. 4.For iOS system, the phones' screen will pop out a "Trust" option, just click it then wait it to connect automatically. 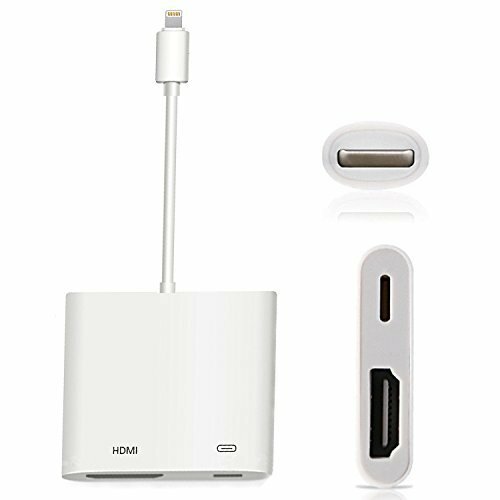 Lightning to HDMI Adapter also outputs video content - films, TV programmes, captured video - to your big screen in up to HD 1080P. If you have any questions about this product by KLTRUST, contact us by completing and submitting the form below. If you are looking for a specif part number, please include it with your message.